Chalk once again rounds up the 50 hottest guys of this year: from athletes like Jeron and Jeric Teng, to singers like Markki Stroem and Sam Concepcion, to actors like Ivan Dorschner and Daniel Padilla, to campus crushes and models, find out who else made it to the sizzling list. 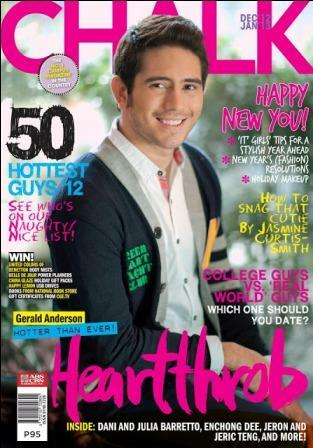 The number one campus magazine will also feature the “Number One Hottie of the Year”, Gerald Anderson, on the cover. Find out more about his only vice – the need for adrenaline rush. He has gone from bungee-jumping to sky-diving and many more. His preference in acting is similar to his activities, as the actor is always on the lookout for a challenge. In choosing roles, he says he wants “something that would make me doubt myself. Because that’s where you work best, when you’re pressured and challenged”. The back-to-back December to January Chalk issue also lists the best in makeup and fashion for the holiday season. Dare to wear the latest trends - like polka dots, neon tweed, and monochrome, plus check out the list of New Year’s fashion resolutions. Also find out how to pull off metallic makeup and color your fingertips with bold, bright shades.